Christmas is coming less than a month time!! Are you guys excited? Have you guys make a trip down to Orchard and Somerset to see the beautiful Christmas lighting already? 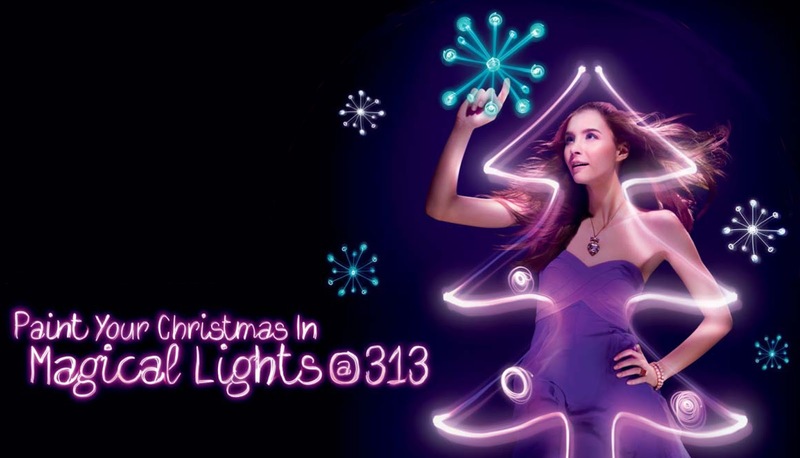 I will be going down to 313 Somerset next week to experience “The Magic of Lights for a Bright Christmas”! This Christmas, 313 @ Somerset is bringing to shoppers an artful display of lights to create the first ever Christmas Light Show and the magical use of ‘light art’ as a paint brush to create brilliant Christmas cards, 313@somerset will dazzle its shoppers with the beauty and mastery of lights to bring added festive cheer. What can you expect from “The Magic of Lights for a Bright Christmas”? Charlie Lim, renowned Singapore photographer introduces his remarkable technique of light art into designing Christmas cards for shoppers at 313@somerset. This method of photography uses a single source of light and paints the subject in the dark while the camera captures the image. The effect is a visual treat that creates a work of art for each shopper who participates. From 7 – 23 December, every Friday to Sunday, 12pm to 7pm, at Basement 2 (next to Din Tai Fung), the first 80 shoppers each day who spend a minimum of $150 will have an opportunity to get their photo taken. All CLUB313 members are guaranteed redemption. Sunday to Thursday at 6.30pm, 7.30pm and 8.30pm, with additional shows on Fridays and Saturdays at 9:30pm. This unique showcase transforms a traditional Christmas tree into a canvas for a brilliant illustration of colours through the use of light projections. Together with a host of other fun activities and festive treats, 313@somerset is taking this holiday season up a notch with “My Christmas Wish List”. From November redemption. From 30 November to December 20, shoppers may be granted their Christmas wish list simply by snapping a photo of items from three stores within 313, and submitting it to 313’s Facebook page – www.facebook.com/313@somerset. 10 short-listed wish lists will go through online public voting from December 10 – 20 and three participants with the highest voted wish lists will each receive $500 worth of 313 shopping vouchers. In addition, five lucky voters will also receive $50 worth of 313 shopping vouchers each. To join in the fun and have a different Christmas this year with 313 Somerset!